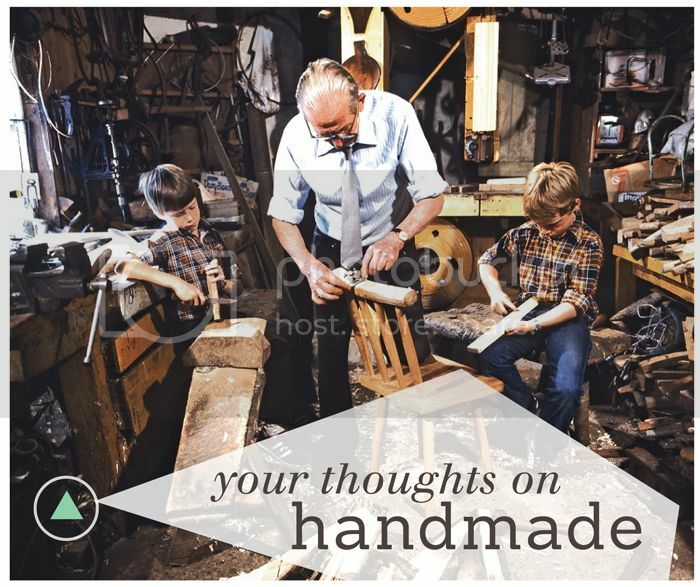 For today's discussion, I wanted to get your thoughts about handmade & diy. The handmade movement has been so huge these past years with Etsy popping up only a few years ago. What do you guys think of DIY craft projects out there? Do you like the idea of DIY and do you actually do any of the projects out there in your own home? I know many of you may come here to see DIY craft projects and get inspiration - but are there ever any projects where you think, "that's weird, I'd never make that." ? Maybe you've seen a project here that you think is just kind of silly? You can be honest, it won't hurt my feelings. ;) I did meet a sweet lady in England who made her business cards inspired from the diy I posted, that was pretty cool to see it inspired someone! Are you a "I can just make that" type of person? For me, there are just some things that I know I am not good at so I'd rather buy it instead of make it. Are you more drawn to supporting a handmade artist over something that's been mass manufactured and produced in another country? Personally, while I love to support and buy from handmade artists and things made local, I'll admit at the same time, I am drawn to the $2 necklace from Forever 21. Would you rather buy the cheaper option or support the handmade artist? I definitely try to support handmade when I can. Craft shows like Renegade are really dangerous for me because I usually want to buy pretty much everything. Fellow crafters are just so creative and some things are so unique, unlike anything you can find at the mall. For small business owners out there who make their own products, do you find having to produce your own inventory limiting to your business? I did a trade show a couple months ago and wholesale was so fun and exciting - getting orders, knowing your products are going into shops. At the same time, it was really hard to meet all the quantities for orders. Took me a while! I have a friend who made 1000 necklaces for a wholesale order, so intense! it was legit. As a business owner, I sometimes wonder about getting my items manufactured. Which at that point, does loose the handmade charm and the fact that I can no longer claim the item is handmade. So I guess there are a lot of pros and cons on the subject. I really like to support handmade art. I especially like to support local artists but if that's not possible, I love to buy from others online. I also like to post about them and encourage my readers to buy from them. I have seen a lot of stuff DIY that is plain stupid. One in particular was where someone cut up spines of books to attach to a box to put on a shelf. It was just stupid imho. But then there is so much out there that is really neat and on my to do list. I too get a kick out of hearing my readers say I inspired them. Recently I ran into a local artist I had interviewed for my newspaper column I used to write on local artists/crafters. She told me how much my blog inspired HER! I was shocked since she's a great artist. Anyway, great discussion. Looking forward to hearing others 2 cents. As an Etsy seller and tight-budget newlywed, I of course love homemade and DIY. Being able to get a great look for pennies less (if I make it myself) feels like such a personal little success to me. Our little condo is primarily decorated with DIY pillows, art, accessories, etc. As far as supporting other artists: I do try to, when I can afford the purchases. Particularly with artwork. There's something really special about owning a piece you know is one of a kind. With smaller items--like a necklace or ring for example--I try to go based of the item's look. If I think its super trendy and going to go out of style in a couple of years or even months...I usually will steer toward the cheaper Forever21 option. But if its a classy or truly unique look and I can afford it, I 'll purchase from a local artist. If its something I know I'm going to get my money's worth out of--like my journals or coffee mugs--I'll bite the bullet and spend for quality and to support the artist community I'm a part of. Whew. That was a long ramble! Sorry about! Good discussion though! We do as much DIY at our home as possible. We love to make all different things. My husband is a great "do-it-yourself / figure it out" doer. Just yesterday, I was trying to figure out how to situate some glass Christmas bulbs after I painted them (I am trying to make my own mercury glass ornaments to attach to small wreaths, which I also made, since I couldn't find what I wanted that didn't cost too much (I need 22, one for each of my windows in our old yellow farmhouse). Anyway, he took a scrap 2 x 4 in his shop, drilled some holes, cut dowel pieces in about 5" lengths, and stuck them in the holes. Perfect!! I can put a bulb on each dowel, spray paint them, and leave them to dry. Love it. He's always coming up with whatever we need for our projects! You always feel better when you make it yourself. We always buy local or handmade if available. I'd rather support an individual than some big company. Have a great day Danni. I'm so glad you got your store up and running again! As a newbie to the handmade business world, I feel that something handmade does add that special factor, compared to something mass produced by a machine. However I do think that it is limiting, we have recently been asked to participate in two flash sales, and had to turn down the opportunity because we did not feel we could meet a high demand of sales at the pace we can actually make the product. Handmade is special, but limiting...someday we hope to have a laser cutter, this will make things go quicker, but we are still hand painting everything...best of both! I definitely buy handmade whenever I can. I love supporting small Etsy shops and local businesses. But, it depends on the situation. I'm going to a wedding next week for a gay couple who just adopted two kids. I'm close with them, but not so close that a handmade gift would be quite right. So, in that situation, I ended up at Target in search of a family gift. If my best friend called me and said she was getting, a handmade gift would be the only option. I love attempting crafts! But what I love more than attempting crafts is buying handmade on Etsy for such good deals! Artists make them and gain profit on them, and they are still really great prices! I'm totally the kind of person that when I see something I like, instead of buying it, I often think of how I could just make it myself instead. DIY gives me a sense of self satisfaction. Although, if it is something I can't make myself, I'd rather buy it from a small business owner. I'm totally into supporting small businesses and I like having things that are unique. This is a really interesting topic. I'm curious to see what other people think. Thanks for posting! Sometimes I DIY, and sometimes I buy all of the materials to make something myself and then never actually do it. Darn you, Pinterest. Or sometimes I find something on Etsy that technically I could do, but it would take me 6 days, and I'd rather support the artist making it while running my own business instead. And I'd much rather buy handmade or from a local business any day. Renegade is indeed going to be dangerous!